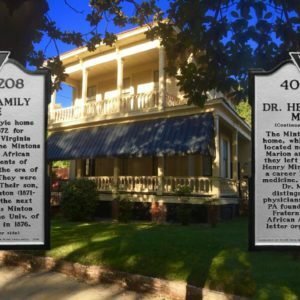 The historic Minton Family Home in downtown Columbia is an Italianate style townhouse built by a prominent family of the Reconstruction era, whose son became a medical professional and founded the oldest African American Greek letter fraternity in the nation – Sigma Pi Phi. Theophilius and Virginia Minton built the house in 1872. Around 1912, the house was relocated from the corner of Gervais and Marion Streets to its current location at 1012 Marion Street. Theophilus Minton, a native of Philadelphia, worked in the South Carolina Reconstruction government and received his law degree from the University of South Carolina in 1876. His son, Dr. Henry M. Minton, became a leading pharmacist and medical doctor in Philadelphia, PA.
On May 15, 1904, Dr. Minton and a group of physicians in Philadelphia founded the Sigma Pi Phi Fraternity (The Boulé,) the oldest African American Greek-letter fraternity in the nation. Dr. Minton is recognized in the 2019 South Carolina African American History Calendar sponsored by the South Carolina Department of Education.